College is back in session and students are in high gear as they study, prepare, and engage in the classroom. I remember some of my most rewarding classes were taught by adjunct professors who had full-time jobs in business. They shared their workplace experiences with us, building a curriculum of insights that kept us informed and well-prepared for an internship or career. My college internship was in a Harrisburg-headquartered advertising agency, and it was the result of an introduction from my adjunct professor. Abby Book, Career Coach for the Career and Professional Development Center at Messiah College, is dedicated to making sure Messiah College students have access to real-world business experience—not only for the information, but for the connections these business executives can provide to students. In addition to a twice-yearly Into the City immersion opportunity for students, Abby organizes leadership panels throughout the year. 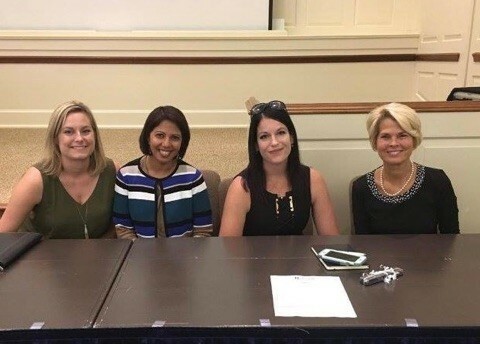 She led one in Hostetter Chapel on Messiah’s campus this month, and I was joined by Jillian Williams, entrepreneur and owner of Bevrore; Amanda Lavis, attorney with Rhoads & Sinon; and Marcella Giovannetti, Program Director for Alcohol and Drug Education at Messiah College. More than 40 students attended and each of us shared our career stories. My path to business ownership was non-traditional: I worked for five years out of college and then off-ramped to stay home with our three sons. After 15 years of leading Cub Scout troops and volunteering in the school district and at church, I took the leap to on-ramp and start my own business. My first book, Women in High Gear, co-authored with Amy D. Howell, was the outgrowth of my on-ramping experiences. It’s the playbook I never had to find my path in the business world. Our second book, Students in High Gear, was written as a call to arms for students to bring their big ideas and passion to energize our economy. It was clear that the Messiah College students wanted to learn about our zig-zags to success, and they earnestly sought any advice we had to offer. We hope our takeaways will be valuable to any student transitioning to college or to the workplace. 1. There is no better time to start a business or make your mark in the world. The sooner we can help our students find high gear, the better for their careers, the community, and our economy. We reminded the students to learn everything you can, meet as many people as you can, develop good relationships with your professors who can give you advice and connect you with business leaders and organizational leaders. 2. What do I know now that I wish I knew in my twenties? Lots of things! I would have asked more questions and considered my possible paths to high gear much earlier than I did. I would not make choices based on what other people think, and I would have developed more confidence early on. 3. Surround yourself with positive, high gear people. Your environment affects your decision-making and your opportunities in the future. Passionate, enthusiastic, smart people not only brighten the workplace, but they exude a contagious optimism that makes everything you do better and more enjoyable. 5. Guard your online reputation and build a powerful digital tattoo. College students and teens don't get a “pass” from talent recruiters when an inappropriate post comes up in Google search. Build your story, refine your presentation and communication skills, and create a powerful personal brand that compels an executive to hire you. You are who Google says you are and for some students, that’s a dealbreaker. For those who understand the potential for good in their social media posts, it's a dealmaker.